When a producer succeeds in expressing a territory through his wines, an emotional alchemy is created, and at the for Santadi winery this by now is the rule. The productive style is giving importance to the exaltation of the typicality, both for the technique of rearing of the vines, and for the cultivated vines. In this soil of sandy matrix, the sapling (here still ungrafted vine!) reigns sovereign in the valorization of the autochthonous grapes (like Carignano). 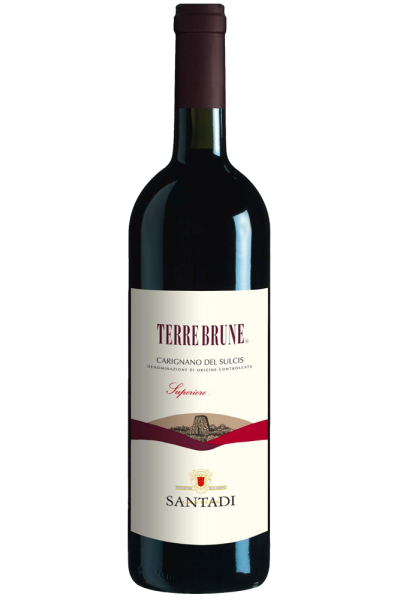 This alchemy reaches the top when we find ourselves in the presence of Terre Brune, a unique and unmistakable wine that leaves its mark on the soul of those who approach it, whether it is the first or the umpteenth time, with its dizzying aromas and its incredible intensity. Intense ruby red in colour, it opens its olfactory range with hints of black cherries in jam, dark spices, black tea and ferrous tones, which bind to red flowers, Mediterranean scrub and bitter almond. Fully matching the palate, it has absolutely perfect tannins and a very long spicy finish. A noble wine for noble meats: Firstly wild game, but also beef filet with porcini mushrooms and the classic suckling pig with myrtle.